" Unstoppable by 10,000 Men 万夫不挡 (wàn fū bù dǎng) "
The ruffian. The impulsive. The brute. Zhang Fei is the youngest amongst the 3 sworn brothers. Compared with his 2 elder sworn brothers, Liu Bei 刘备 and Guan Yu 关羽, Zhang Fei tends to get in trouble for his quick temper and his love for alcohol. Some say his fighting ability is the strongest of the three. Zhang Fei is probably amongst the 5 most famous and popular characters in Romance of the Three Kingdoms. One of the reasons for that is the fact that he may well be the only comedic character in the entire cast of over 1000 characters in the story. Judging by most portraits of him, you wouldn't be blamed if you thought you was half-man, half-woolly mammoth. Character ability: "Berserk 咆哮 (páo xiāo)"
During your action phase, you can use any number of ATTACK 杀. The literal translation for 咆哮 means "roar". 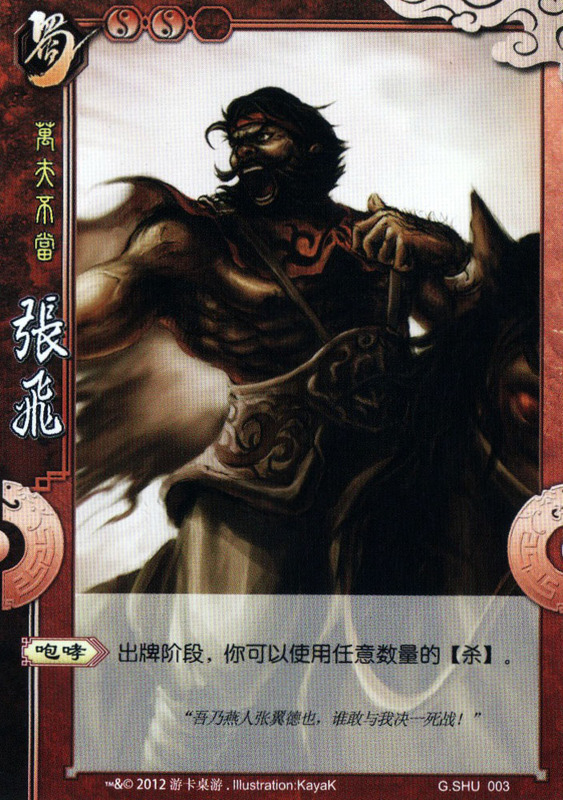 Zhang Fei is famous for his loud roar that scared away an entire Cao Wei 曹魏 army. That, however, has nothing to do with the game character's ability to repeatedly use ATTACK. You kind of get the feeling that the game makers based the ability of Shu Han 蜀汉's generals not so much on their historical basis, but more for the completeness of the game mechanism (ie: "it would be nice if a player could do THIS... let's allow Zhang Fei to do that"). The ability of 咆哮 has the use like ‘Barrage’, but it should not be used to describe Zhang Fei’s ability, since Zhang Fei defeats his enemy by spear with brutal force, not firing arrows (So "Barrage" is better to describe Yuan Shao’s ability). 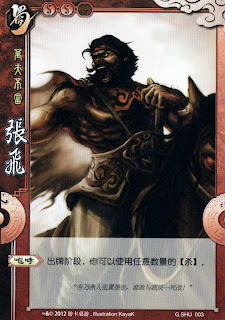 "Berserk" would be a better choice, since Zhang Fei fought like a berserker, roaring (咆哮) and swinging his halberd infinitely (Multiple ATTACK cards in one turn).